It’s the Queen’s 90th birthday tomorrow, April 21, but proving some are never too long in the tooth, Her Maj is currently advertising for a new head of social media. 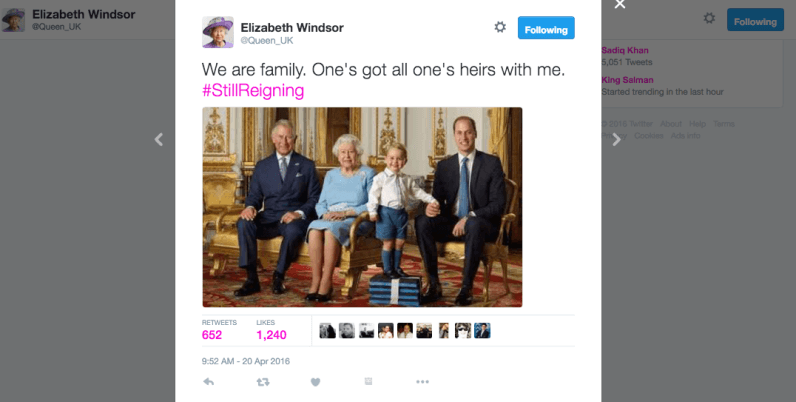 The UK’s Royal Family is offering up to £50,000 (almost $72,000) for someone (responsible, presumably) to work as its head of digital engagement in charge of websites and social media accounts with an audience of potentially billions around the world. You’ll work over at Buckingham Palace, have 33 days of holiday and, even though there is usually no such thing, get free lunch. You will manage accounts like ‎@BritishMonarchy, @KensingtonRoyal and @ClarenceHouse. However @Queen_UK is, apparently, a parody. Have decided to abdicate. Kidding, kidding! Sorry Charles, mummy's just teasing. So what will be your first retweet on the job? This is starting to look like Boaty McBoatface all over again.